Using the Win32_Product WMI class to inventory installed MSI products does some very unexpected and nasty things. If you are using this class locally to retrieve product data we have a replacement that is not only much safer, it is a million times faster (roughly). Have you ever need to view, update or add an internal manifest in an EXE? 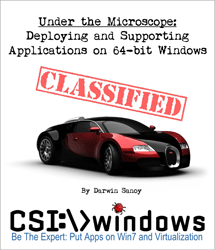 Here is a tool that is Free, User Friendly, supports 64bit and is kept up to date. The VBScriptUACkit consists of a group of VBScript procedures that allow a script to check whether it is running with full admin rights and to relaunch elevated if needed. It is able to check whether a user is a protected admin (unelevated admin) so that it can prompt only if admin permissions can be given. This allows a better user experience and it allows proper status reporting, rather than script failures. Our Bginfo template has been updated to version 1.6. It has been updated to accurately report whether the OS is 32 bit or 64 bit and whether the Hardware is 32 Bit or 64 Bit. This script code uses a fast and efficient method for determining whether the current session (process) has admin rights. The compact code is provided in VBS (9 lines) and CMD/BAT (3 lines). It works with XP / Server 2003 through Windows 7 / Server 2008. It works with UAC (reports admin rights only if session / process elevated). It uses passive methods to determine rights – in other words, it does not try to change anything on the target system. Disabling unnecessary Windows services can result in significant performance gains for production machines and virtual machines. This script helps you manage and share templates for services optmization - including only starting services when they are needed. Some services optimization templates are included and instructions are included for converting from other services optimization tools. Click "Read More" for much more information about the benefits, uses and implementation of the script. RegScanner is a very cool little utility for finding things in the registry. RegEdit's built-in search functionality is similar to notepad. Type your search string and keep pounding F3 until you find something similar to what you're looking for. Lots of wasted time. ACT 5.5 has been released. Microsoft has made sure that the entire toolset is Windows 7 ready. The help documents have been enhanced with more information on Shims - Microsoft has been making big improvements on the help documents for over a year.